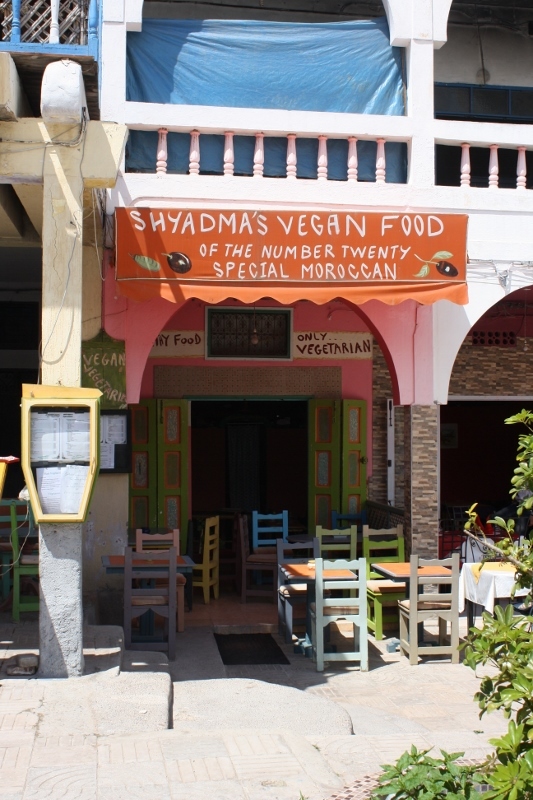 Shyadma’s is one of only a couple of purely vegetarian restaurants in Morocco. It’s in lovely, laid-back Essaouira and this laid-back fashion certainly made its way into the restaurant. Situated in a sun trap of a courtyard at 20 Rue Laalouj in Place el Khayma, it’s a wonderful place for a spot of lunch….. but you might want to make sure you have a couple of hours free as the food is cooked from fresh and can take some time to be prepared, or perhaps the owner is at the mosque for prayer and you just have to wait for him to get back! Whilst waiting for his return, someone, we weren’t sure who, came to attend to us and delivered some olives, bread and argan oil to our table to keep us going. The bread and oil were delicious but the olives were far too strong for my liking. I was informed they are organic though so perhaps to an olive connoisseur they are olive perfection. 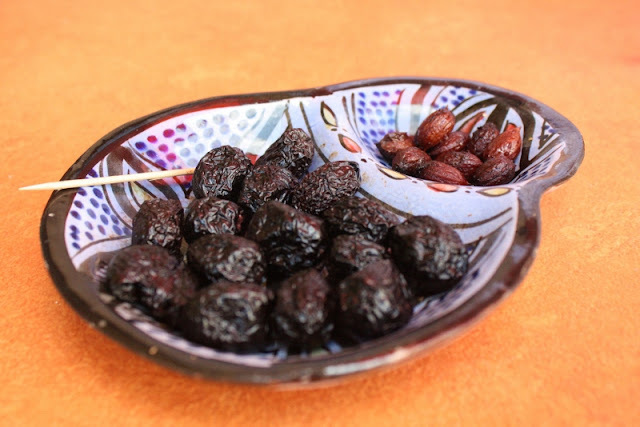 On the menu are a selection of salads, including the traditional Salad Marocaine which is a simple salad of chopped tomato, cucumber and onion, seasoned into deliciousness and found everywhere in Morocco. 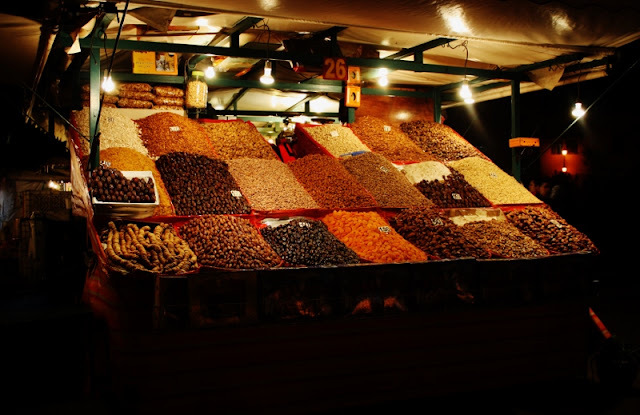 There are also vegetable tajines of every variety imaginable, including onion, preserved lemon and olives, quince, lentil and cauliflower and a vegetable couscous. The specials included vegetable and cheese filled filo pastries, spring rolls and veggie burgers. Myself and my partner opted for the chickpea tajine, vegetable couscous and fresh red bean, chickpea and lentil burger despite our server seeming keen to sway us against choosing it…..
As with all food in Morocco, I found the tajine to be delicately flavoured, rather than packing a flavourful punch as I had expected Moroccan food to do, but it was delivered to our table still sizzling in its pot and the couscous was light and fluffy with huge strips of vegetable on top in a mild vegetable broth. The burger was by far our favourite dish, it had a very unusual flavour that I couldn’t quite put my finger on, but which was truly moreish! A little odd, was that it didn’t seem to have been cooked in the restaurant as someone delivered it from across the street. Mostly likely the reason for trying to convince us not to order it?! Indeed, this was confirmed as we finished our meal and the plate was once again whisked away and taken to a nearby restaurant. Not sure about that one…… I just hope that it was cooked to vegetarian standards! Portion sizes are huge and coupled with the usual bread and olives in way of an appetizer, I can confirm that it is only necessary to order one dish per person :) Three between two was way too much.